This is one of those dishes that just kind of happened; I was planning a romantic dinner for BandMan and myself, but felt much too lazy to go to the store and get anything. So I decided to make due with what was in the fridge. So, I opened her up and found beets, a butternut squash, kale, and some quinoa. Ok, so the squash and quinoa were in the pantry but let's not argue semantics here. 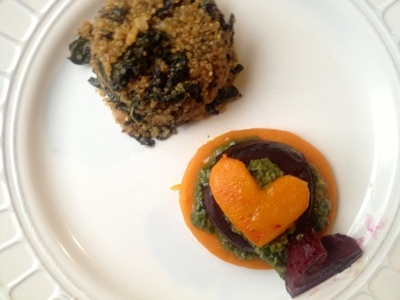 I served this beautiful dish with quinoa with garlic and kale. Prepare a batch of pesto and let sit. Slice the beets and butternut squash and pop those suckers in the oven until they are tender. This could be 30-60minutes or so. While they are in the veggies are in the oven and the pesto is sitting, prepare the cashew cream sauce. When you are ready to plate, lay down the butternut squash and top with a tsp or two of pesto. 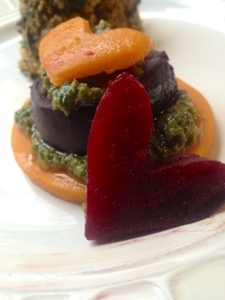 Top with a beet slice and add some more pesto. Repeat as many times as you wish and serve with some cashew cream sauce on the side.